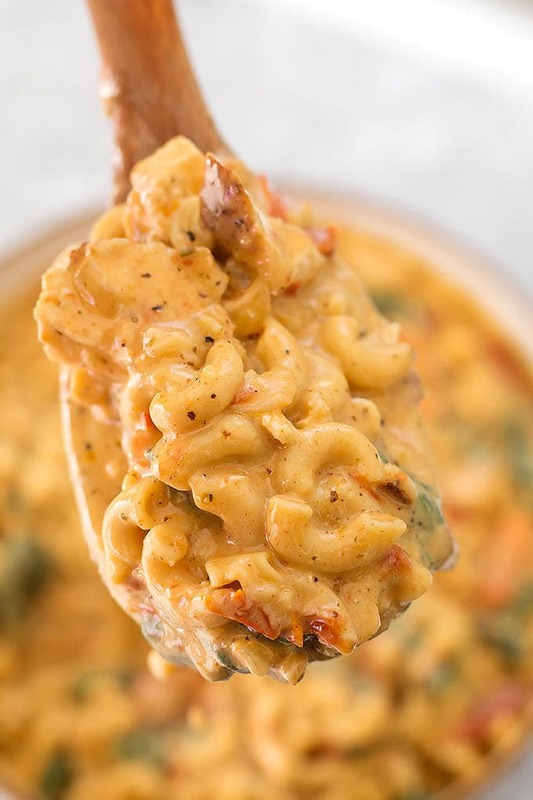 If you are looking for something a little more special to make for dinner, try this Instant Pot Creamy Garlic Tuscan Chicken Pasta. It has a lot going on! Tender chicken in a rich, creamy sauce flavored with sun dried tomatoes, garlic, and finished with fresh baby spinach. A wondrous one-pot meal made in your electric pressure cooker! This is a meal you could proudly serve to your special guests, or make to treat your family special! Instant Pot Creamy Garlic Tuscan Chicken Pasta is a long name, but not short on flavor! Super delicious, and wonderfully creamy, without being too heavy. We love a good pasta dish around here. Even better if it is loaded with flavorful ingredients! 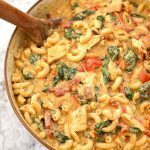 As much as I enjoy a tasty basic Instant Pot Mac and Cheese, there are times I want something really different. That is what this recipe is. I just adore the flavors. 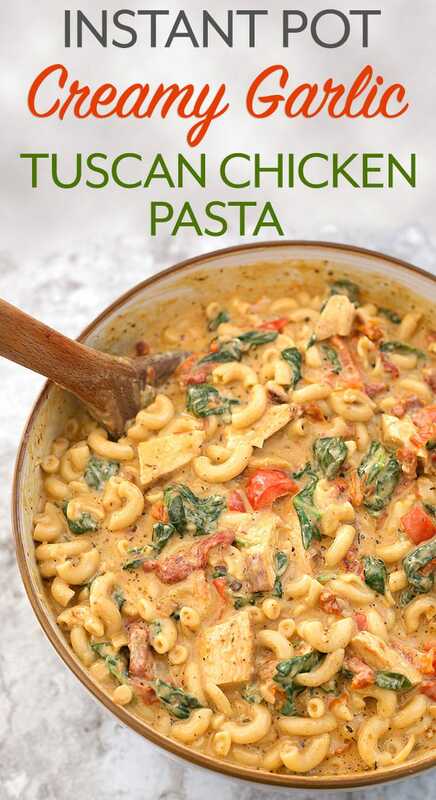 It is truly a one-pot meal with the chicken and spinach in there! I’ve been asked how to be successful making Instant Pot recipes. Well, with any recipe, I practice what is called “Mise en place” (French pronunciation: ​[mi zɑ̃ ˈplas]), a French culinary phrase which means “putting in place” or “everything in its place.” My number one tip is to get everything ready. Chop the onions, peel the garlic, measure out all of the liquids, pasta, and spices. It is a much more enjoyable process when everything is there at your fingertips! Since you will be using the Sauté feature throughout most of this recipe, you won’t want to leave it unattended for long. Having said that, it’s a pretty easy recipe, considering the outcome is so outstanding! Instant Pot Creamy Garlic Tuscan Chicken Pasta takes about an hour to make, with the prep. Not too bad! I hope you enjoy it as much as we do! 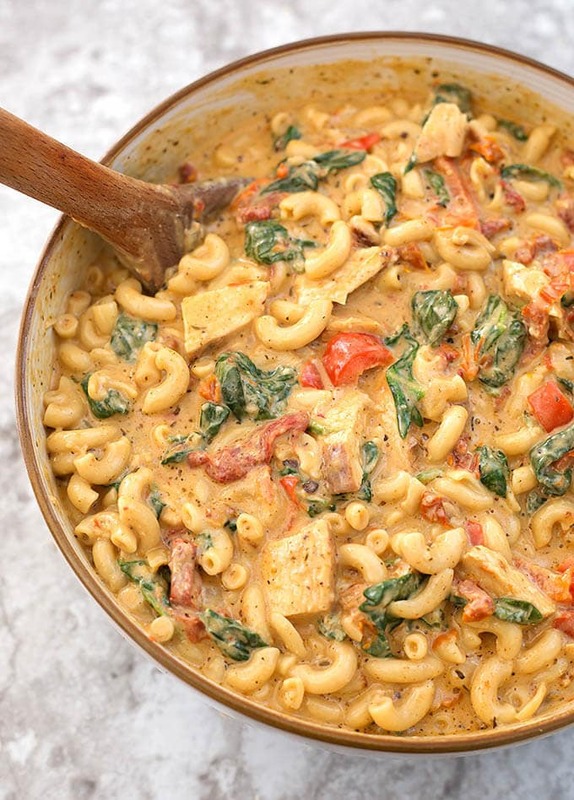 Instant Pot Creamy Garlic Tuscan Chicken Pasta has tender chicken in a rich, creamy sauce flavored with sun dried tomatoes, garlic, and finished with fresh baby spinach. Rub the chicken with 1 Tbsp of the divided oil, paprika, salt, and pepper. Set aside. Turn on the Sauté function of the pot. When the display reads Hot, add 1 Tbsp of the olive oil that you divided. Add the chicken breasts and cook them for about 4 minutes per side, until you get good color on both sides. Remove to a plate and cover. Add 2 Tbsps of the butter and the onion. Sauté for a few minutes and then add the bell pepper and the garlic. Cook for 1 minute, stirring frequently. Add the wine (or 1/3 cup broth) and stir, scraping the bottom of the pot to deglaze it (scraping up all of the brown bits from bottom of pan). Add the sun dried tomatoes, sun dried tomato oil, Italian seasoning, oregano, thyme, salt, and pepper. Stir in the chicken broth and the milk. Let come to a simmer, then add the pasta. Stir. Add the chicken breasts and put the lid on the pot, locking it in place and turning the steam release knob to the Sealing position. Select Pressure Cook (or Manual) and use the + or - (or dial) to choose 4 minutes. When the cooking time is done, and the pot beeps, do a controlled Quick Release of the pressure. Start slow so you minimize the risk of sauce spewing out with the steam. Then let it go fully. When the pin in the lid drops down, open the lid and stir the contents (there may be a little stuck on the bottom, just scrape the bottom of the pot to loosen it. Remove the chicken to a plate and cover with foil or a lid that will keep the heat in. Do not leave it uncovered as it is still finishing cooking that last bit. Mix together the flour and remaining 2 Tbsps of softened butter until combined. Stir into the sauce. Add the cheeses, stirring after each one. Take the temperature of the chicken. It should read 165 degrees (F). Cut it into bite sized chunks and add it to the pasta. Stir it in. Serve garnished with torn basil leaves. This is a saucy dish, it won't be thick like mac and cheese. Very good!! Thank you! Loved the flavor!! Hi Kerstin! I’m happy that you liked it! Thank you for the nice review and feedback! Yum! How would you go about swapping the breasts for thighs in this recipe?? Hi Summer, I would use about 2-3lbs of thighs. Since the breasts I use normally weigh about 6-8oz. Hi Steve. Half and Half is a milk product. A mixture of half heavy cream and half milk. Made this tonight and really enjoyed it. I was a little nervous after the pressure cooking cycle- seemed like a lot of liquid- but I figured it would thicken up and it sure did! It was great with some garlic bread. Definitely will make it again! Wondered if different pasta can be used…rotini or penne? Hi Lorraine! Thank you for your review. I have used penne with great success. Haven’t tried it with rotini, but I’m sure it would be good. Just keep in mind that heartier pastas need a minute or two more cook time. For penne I cook 5 minutes. A good rule of thumb is half the recommended cook time in the pasta package directions. If you make it and the pasta is a little too al dente, just put a lid on the pot and let it sit a few minutes to soften it. Wonderful recipe! We used bow-tie pasta and followed the 4-minute directions, however I left the meal in the warm pot (not on the “keep warm”) setting so it had a little more time. This was delicious! I’m so glad you liked it, Mary! It’s a good one! Thank you for your review! How would I adjust time if all I have is frozen chicken breast? Hi Ashley! It’s a pretty short cook time, so I would try to soak the chicken in some cold water to start thawing it. Then, if you can, cut it in half or even in thirds to reduce the size. Then just toss it in. If you aren’t opposed to defrosting it in the microwave, even partially, that’s another option. Ideally, the smaller pieces of chicken will cook faster. Delish! Made with bowties, still used 4 minutes. So flavourful and creamy. A new dish for the rotation, Thanks! This was delicious, but the sauce was a little too thick and cheesy. I would cut all the cheeses in half. Also, there was some leftover paprika and salt and pepper. Was that supposed to be added back in at some point? Otherwise, it’s a definite winner and will make it again! Hi Jill, thank you so much for your review. I had altered the recipe a little to make it thicker, as many reviewers were telling me it was delicious, but a little too soupy. I may need to have an in between. The spices are just to season the chicken, so if you have leftover, toss it. I would say add it to the pot, but I would taste for salt first. I appreciate you taking the time to give me your feedback, and so glad you like the recipe! Can this be made without pressure cooker? Yes it can. You would cook the chicken and onion, etc in a skillet, cook the pasta in a traditional pot of boiling water, then add the cream and cheese at the end after mixing it all together. Made this tonight. Added a few strips of bacon with the chicken, and a few shakes of red pepper flakes. Turned out great! The only problem was that my pasta was a little over done. Not sure what I did wrong. By the way, this made a LOT of food. We’ll have leftovers for days. Yummy! I used heavy cream instead of 1/2 & 1/2 cause it’s what the hubby likes. I also added mushrooms, frozen peas and spinach with the chicken. This will be a keeper! Thanks! Yum! I’m glad you and your hubby liked it! Thanks for your review! Absolutely fantastic! We used a Dutch oven to make this, so obviously a little more time added. We are thinking about trying this in the crockpot! Would not change a single thing about this! That’s great, Charlotte! Thank you. Happy New Year! This is, hands down, the most delicious Instantpot meal I have ever fixed. I used penne,and it turned out perfect. Even the picky eaters in my family loved it. I’m on a lower sodium diet, so I skipped the extra salt and it still turned out fantastic. Thank you, Courtney! That’s awesome! Is it possible to make this without the chicken? Yes. I think I answered you in the IP group, but in case someone else has the same question, just start from sautéing the onion and go from there. Made this for dinner tonight because I wanted to impress my husband for our second wedding anniversary. It worked!! I feel like we are ourselves into a food coma. This recipe is truly amazing!! Thank you! Happy Anniversary! Thank you for your review!